This course is made up of 5 modules total, and below is the whole outline for your quick reference. You also have a workbook for you to complete the various exercises we will walk you through. It's also the perfect place to take notes during the videos. You can download that workbook at the bottom of the table of contents! - Why Start with Why? - Why Do You Want to Play Baseball in College? Click Here to Download the Full Recruiting Roadmap Workbook! We created this course with one main goal - to help you! So, with that in mind, we want to share the following five tips to help you get the most out of this course. Treat your plan like a living document. Block out specific chunks of time throughout your week where you can dedicate time to your Recruiting Roadmap. We recommend looking at your weekly schedule and trying to find a consistent time of day where you can spend an hour or so working your Recruiting Roadmap plan. For example, maybe 8-9pm every night you will work on your Recruiting Roadmap before you watch your favorite TV show and go to bed. Make sure the time block works, and you’ll probably have to be flexible as life happens, but planning out your work blocks is a great way to make sure you get the most out of your Recruiting Roadmap. When it comes to something as important as your recruiting process, you should enlist the help and support of the people around you. This is YOUR recruiting process, and you need to be the one taking charge of your recruiting process, but it’s a good idea to get some help. Don’t be afraid to reach out to parents, coaches, and the Recruiting Roadmap Facebook group with any questions you may have. You have lifetime access to the Recruiting Roadmap course, but don’t let that cause you to procrastinate. You only get one chance at your recruiting process, and you should get started today! You don’t have to do everything today, but at least get started and begin building some momentum. You can’t cram for your recruiting process like you can for a test (but you shouldn’t cram for your test either!). You have take the first step and invested in this course, so now it’s time to start now! You are going to work through a lot of big, important questions as your put together your Recruiting Roadmap. Keep in mind that as you learn, grow, and live, your preferences may change. Your plan is not set in stone after you go through the course the first time. Treat your plan like a living document. Review it. Go back through it. Make changes as needed so that you ensure that your plan is helping you all the way through your recruiting process. As you have already heard from us, and will continue to hear all throughout the course, this recruiting process is all about you. We are here to help. Every lesson and resource in Recruiting Roadmap is designed to help you navigate the recruiting process successfully. But, we can’t do the work for you. We will help you understand everything that you need to do, but at the end of the day, it’s about you doing the work. You can have the best map and compass ever created, but if you do not put one foot in front of the other and do the work none of that will matter. We know that our process works because we have walked with thousands of high school players throughout their journey towards college baseball. And, we have current college coaches on our Recruiting Roadmap staff that are in the recruiting world every day. We can’t, and won’t, promise you anything in the future. That would be irresponsible of us because that would be claiming to control the future. But we can, and do, promise you that if you put together your Recruiting Roadmap 3 Step Plan to College Baseball then you will have the best possible plan and give yourself the best possible opportunity to play college baseball. Now, let’s dive in and get you your Recruiting Roadmap! Why do you want to play baseball in college? While that my seem like an obvious question, every player has to answer that question for himself. Deciding where to play college baseball is a family decision, but the player is the one who has to want it for himself. Sit down and answer the question, why do I want to play baseball in college? Knowing 100% that you want to play baseball in college, and why you want to play baseball in college, is essential before going any further. The reason for this is that your WHY is the compass for your journey. A roadmap is great, but its usefulness diminishes drastically if you do not have a compass. What good does knowing you need to head North on the Roadmap without a compass telling you which way is North? If you have BOTH a roadmap and a compass, THEN you truly know where you destination is. Without both, you a left wandering without a direction. And, if you don’t know where you are going, how will you know when you get there? Determine Your Why gives you the compass you need to follow the Recruiting Roadmap to college baseball. And, there is one more reason you must Determine Your Why before doing anything: the recruiting process is hard. Let’s just get that on the table now - the recruiting process is full of questions, uncharted territory, and frustrating roadblocks. Your WHY is the foundation that you can rely on when the inevitable roadblocks come your way. There is way too much outside of your control throughout the recruiting journey to be traveling without a roadmap and a compass. This is probably the easiest step in this whole plan to skip. We know that it is tempting to jump ahead to get to the nuts and bolts of this course, but please trust us. We cannot encourage you highly enough to take the time to think through this essential question because it truly is the foundation for everything in your recruiting journey. What follows is an article called "College Baseball: The 16-Hour Day." The link to the article is included below, and the video above is based on this article. Why Do You Want to Play College Baseball? Now it's time for you to spend some time thinking through the question, why do I want to play baseball in college? Again, we know that this seems pretty abstract and philosophical. We also know that you are probably hungry for a lot more practical tools. Those are coming, we promise. Don't skip this first step - it truly is the most important place to start. Take some time - as much time as you need - and come up with your answer to why do I want to play baseball in college? Grab your workbook if you printed the whole thing off at the beginning, or you can download the Determine Your Why Answer Sheet attached to this lesson. After you've taken some time to answer this essential first question, go ahead and get started with Step 2: Develop Your Strategy. Until then, we'll see you in the next lesson! This might sound harsh, but nothing else matters if you are not good enough to play in college. There is a saying that “good marketing simply makes a bad product fail faster.” You can have the best recruiting strategy ever developed, follow every best practice imaginable, and literally do everything right through the recruiting process, but the bottom line is that if you are not good enough to play in college then it won’t matter. College coaches will not recruit you to play in their program. We would be remiss if we did not include this step in your Recruiting Roadmap. Your recruiting strategy matters and we are headed there next, but after Determining Your Why, you also need to objectively evaluate your baseball skills and have a plan to improve them. Using page 3 of your Recruiting Roadmap Workbook - or the page attached to this lesson below - take the time to honestly evaluate your strengths and weaknesses as a player, and put together your Player Development Plan. To start, think through your Top 5 Strengths. What do you do well? In what ways do you contribute to a team most significantly? Then, next to each step, write down action steps for how you will build on those strengths. The key here is to make sure that your action steps are very specific. Avoid general, vague statements like "hit better to the opposite field." Instead, include what specific drills you'll do, how many times per week you will practice, what resources or instruction you need to improve, etc. Be specific with your action steps. After going through this exercise with your strengths, repeat the same process for your Top 5 Weaknesses. Be honest with yourself here - every baseball player on this planet has holes in their game, including you, so don't be afraid to think about the areas of your game that you need to work on. Your skill development is the most important investment you can make in your potential college career. How important is the school’s proximity to home to you? Do you want to be close to home? Far away? Indifferent? Are you willing to go to a small school to play? Or, would you prefer a big school even if it means walking on? What do you want in a school academically? Any particular programs you are already interested in? How much does the reputation matter to you? Do you want a school that prioritizes academics? Or, one that is more flexible with sports? i.e. What happens if a required class conflicts with practice? Do you want the chance to start as a freshman? Or, are you willing to work your way up? Are there upperclassman ahead of you? Does the school recruit JUCO transfers? What do you want in a coaching staff? New? Experienced? Has the coach been there a while, or does he bounce around every couple of years? What role does the cost play? How important is scholarship money in your equation? What is your approach to student loans? Fill in your ratings and your reasons in your workbook, or in the sheet attached to this lesson. After putting together your Player Development Plan, now it's time to dive into the second step to playing baseball in college - the recruiting process. So far you have Determined Your Why and thought about your core motivation(s) for playing baseball in college. Next, you need to think through what is important to you in a college baseball experience. To do that, we work through what we call Your Personal Baseball Equation. We like the analogy of an equation because the "sum" is the same for everyone - play baseball in college. But all of the factors that go into that equation vary for each person. None of these factors are necessarily better or worse, but they are different. It's important to understand what is important to you because college, and especially college baseball, is a huge commitment and a big decision. The best opportunity for a great experience comes from making a decision based on what is best for YOU, not anyone else. Take some time and think through the importance of each of the following factors. Rate their importance using a scale of 1-5 (5 = most important), and give a reason for that ranking. Then, once you're done you can take a look back and start to see what is most important to you and what is less important. This equation will be extremely helpful as you evaluate your options. There are no perfect baseball programs or coaches, but using this tool you will at least be able to define what your negotiables and non-negotiables are and make decisions accordingly. With your Personal Baseball Equation in hand, the next step is to think through a list of schools you'd like to pursue. Before actually making your list, though, we have one word of caution for you: avoid the Division 1 bias. We define the Division 1 Bias as the mindset that Division 1 college baseball is inherently better than any other college baseball opportunity. That is simply not true. At Recruiting Roadmap, we want you to find the best possible college baseball experience for YOU, and the reality is that for many players Division 1 is not the best fit. Our hope is that you find an opportunity to play in college that is at the highest possible level that provides the best possible fit for you as a baseball player. If that is D1, great. If that is NAIA or JUCO or D2 or D3, that is awesome, too. We hear about the big schools all the time because many of them are all over TV all year around with their various sports. We also hear about them from peers who are quick to announce the commitment to play at a division 1 school. Division 1 is an awesome goal, and it can be a fantastic experience, but we could not encourage you more to keep your options open. Just because you have never heard of a school does not mean that it is not worth exploring as an option. 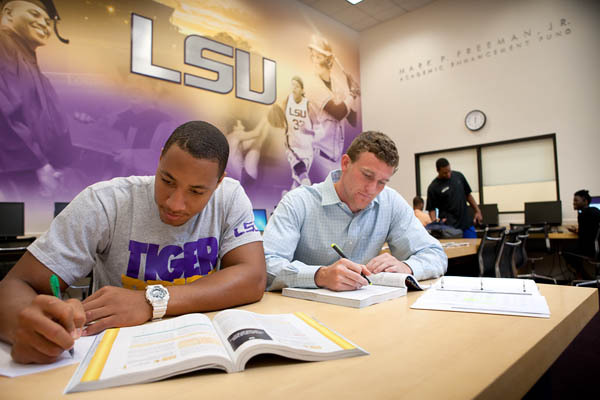 As you put together your list, you should definitely include your dream school and set high goals. But, we want you to think seriously about where your best opportunities may be, and you should always keep your options open. Your action step for this lesson is to do some research on potential schools that fit your Personal Baseball Equation and make a list of FIVE schools in all five levels of college baseball (D1, D2, D3, JUCU, NAIA). You can do this in your Recruiting Roadmap Workbook or on the downloaded sheet attached to this lesson. In today’s recruiting landscape, there is a lot of noise. There are tons of different opinions, recruiting services, tools, and options for you to use on your journey towards college baseball. There are valuable tools and exposure in the midst of all the recruiting noise, but you need to be careful and do everything you can to ensure that you are investing your time and resources in tools that will actually help you. One of the first things you need is video. Our Recruiting Roadmap staff includes current college coaches, and the first thing we ask for when we hear from a potential recruit is video. Most schools don’t have the budget to see every player they are interested in in-person. And, even those programs that do have big recruiting budgets still cannot send their coaches to two places at once. You need a video that showcases the skills that college coaches want to see (i.e. pitching from both the side and behind the catcher). In today’s recruiting landscape, a quality recruiting video is virtually a requirement. Is it a one-day or two-day event? How many swings and/or pitches do you get? Do you leave with any tools? The list of important questions goes on, but the bottom line here is that not all showcases are created equal. Your time and resources are limited, so please, please, please choose wisely when it comes to a showcase event. Lastly, you need a guide. The journey towards playing baseball in college is confusing. There is a lot of noise and many roadblocks along the way. You need a trusted resource that can help you ask the right questions so that you can get the information you need to make the best decision you can possibly make. Your Recruiting Roadmap is the perfect place to start, but you should also leverage your relationships with friends and coaches to help you as well. No one should try to make it through this process alone. The mindset you take into your recruiting journey will have the greatest impact of anything on your experience. There are three elements that make up the recruiting mindset, and each element will help you navigate the recruiting journey in a positive, healthy way. Remember that all it takes is one coach to like you in order to give you the chance to play baseball in college. Avoid the trap of comparing how many coaches are recruiting you compared to others. You never truly know what conversations other players are having with coaches (there is a lot of embellishment that goes around), and your focus should be on quality interactions with coaches over quantity. It only takes one coach to offer you a spot that fits what you are looking for in order to achieve your dream of playing college baseball. The second element of the Recruiting Mindset is Maintain a Thick Skin. Recruiting is an evaluation process. If you take every negative evaluation or lack of interest personally, you’ll be burned out in no time. One of our staff members was told at a showcase that he was not a Division 1 catcher while he was a junior in high school. He went on to entertain 10+ Division 1 offers later that same year and ultimately signed to play baseball at Duke University. Just because one coach is not interested in you does not mean that all coaches agree with him. Maintaining a thick skin will help you navigate the recruiting journey without letting the evaluation process get the best of you. Different people have different sources outside of themselves that they put their trust in, but the bottom line is that you need to find something to put your trust in. There is way too much involved in the recruiting process that is outside of your control for you to navigate the journey without trust. Trust your Recruiting Roadmap. Trust your family and friends. Trust in something bigger than you. Trust that you are doing everything you can to give yourself every possible opportunity to play baseball in college. Trust above all else is what will help you stay the course and put one foot in front the other when you encounter obstacles along your recruiting journey. And, at the end of the day, its important that you trust in the fact that if you do everything you possibly can be maximize your abilities as a baseball player and opportunities to play baseball in college, then there is nothing more you can do. What does a person have to give that is more than their very best? No matter where your final destination may be on your journey to college baseball, trusting that you have done everything you possibly can will help you find peace of mind when the journey ends. The importance of effective communication should go without saying. Communication is what our world is built on. And yet, despite it's seemingly obvious importance, it's amazing how much bad communication takes place every day. What follows are our Top 5 Communication Best Practices we recommend for you to use throughout your recruiting process. If you communicate well, you will immediately differentiate yourself from many of your peers. Trust us. As we have mentioned before, our Recruiting Roadmap staff consists of current college baseball coaches, and we know from experience how poorly many potential recruits communicate. There are a lot of baseball players looking for college baseball opportunities, and your communication is one way you can stand out in a crowd - and the best part is that you have complete control over how well you communicate. You will differentiate yourself from most recruits by simply being responsive. It’s amazing how many phone calls, emails, and text messages are sent to potential recruits with nothing but crickets on the other end. Respond to every coach you hear from in a punctual, respectful manner and you will stand out in the crowd. Also, keep in mind that you honestly don't know the exact path of your recruiting journey. No one can predict the future. Your journey might go exactly as expected, or you could end up in a very different scenario than you ever imagined for a variety of reasons. It is a good idea to respond respectfully to everyone and keep your options open. What you are thinking now might be different than what you are thinking in the future, so you it is best to avoid burning any bridges. College coaches get a ton of emails, so the quality of your email could be the difference between getting on a coach's radar and getting lost in the shuffle. Coaches are extremely busy so their turnaround time in responding may not be as quick as you want. Don’t take that personally (remember the note about thick skin above?) Be reasonable in your expectations, but don’t be afraid to be persistent with a follow up email if you don’t receive a response within a couple of weeks. Don’t assume anything about any school. Welcome the conversation from any coach that shows interest, ask questions to learn as much as you can, and then use your equation to determine if that school is a good opportunity for you. It’s easy to assume you know about a program or a school, but we would challenge that assumption. You never know what opportunity may end up being the best for you. Why should a coach want you in their program? Always be humble, but don't be afraid to share what you have to offer and how you’d contribute to someone’s college program. Write this out. It’s normal to be a little nervous when talking to a coach, so having a list of bullet points or even a script can be helpful. This final action point in Step 3 is the culmination of your entire Recruiting Roadmap. Information is power. Use your Recruiting Roadmap to make informed choices. You don’t need us to remind you that we all have limited time and financial resources. You also don’t need a reminder that you only get one chance to travel through the recruiting journey. No one - seriously, no one - can truly guarantee you a chance to play baseball in college. That would be predicting the future, which no human being can do. We can’t promise you a college scholarship, but we can promise you that if you do everything you can to give yourself every possible opportunity to play in college, you will have peace of mind knowing that you did your best. Don’t throw darts at a proverbial dartboard when it comes to your recruiting journey. Follow your Recruiting Roadmap. Put in the necessary work to develop as a player. Invest in good resources and recruiting opportunities. Execute your game plan to the best of your ability. Make informed choices about where you spend your time and resources, and when the opportunity comes, where you choose to play baseball in college. If you want good information, you'll need to ask really good questions. Below is a PDF printout (it's also included in the bonus resources section of this course) of a bunch of really good questions. That list is certainly not exhaustive, but it's a great place to start and will undoubtedly help you think of other questions you might want to ask a coach. Now that you have made it this far, congratulations are in order… Congrats on making it through the course! You should be proud of the work you have done so far, because you have definitely put in a lot of hard work on your Recruiting Roadmap. Here’s the thing, though - you should be proud of your hard work so far but you can’t afford to be complacent. 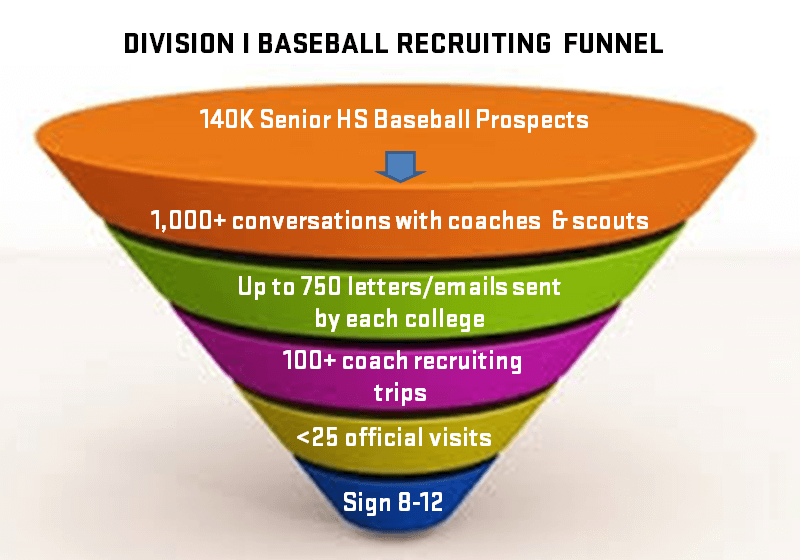 Now that you have Your 3 Step Plan to College Baseball, it’s time to follow your Recruiting Roadmap all the way to your goal of college baseball. We know that our process works because we have walked with hundreds of high school players throughout their journey towards college baseball. And, we have current college coaches on our Recruiting Roadmap staff that are in the recruiting world every day. We can’t, and won’t, promise you anything in the future. That would be irresponsible of us because that would be claiming to control the future. But we can, and do, promise you that if you put together your Recruiting Roadmap 3 Step Plan to College Baseball then you will have the best possible plan and give yourself the best possible opportunity to play college baseball. If you have any questions don’t hesitate to email us at staff@bestintheusshowcases.com. We also encourage you to take advantage of the Facebook group to crowd source your questions and learn from the experiences of others. As a Best in the US attendee we provide you with a player page, but if you have pages on another service make sure to follow these rules when making and sending your recruiting page! We get it.. You get bombarded with prospect camps, showcases, tournaments, and so much more all the time! Here is a quick guide to sift through whats important and what is just loud noise! Social Media is huge these days, don’t let it be the reason a coach takes another athlete over you! Maybe one of the most important resources in this whole course! Did you know the NCSA has over 83,000 athletes ranging grad years 2019-2023. Before putting your recruiting future in a service’s hands, read this quick guide! Whether you are new to the recruiting process or a graduating senior, you may not know some of these terms when they are thrown around! ALL recruits that we see share some of the same characteristics… and it stretches much further than what they can do on the field! Let’s break down some of the common misconceptions and myths surrounding high school and college baseball! A quick guide to the differences between the levels of college baseball. So you’ve gotten the opportunity to go on a college baseball visit. Here are some things to look for and areas you need to visit for your future! Want to see where your grades stack up? Check out this quick guide! Of course, admissions will vary from school to school!